The Detention of Evo Morales: A Defining Moment For Latin America? Last week’s grounding of Bolivian President Evo Morales’s plane in Europe, after U.S. officials apparently suspected whistle-blower Edward Snowden of being on board, caused an uproar in Latin America. If the U.S. government was seeking to intimidate Morales and other Latin American leaders who might consider harboring Snowden, its strategy has completely backfired. As the international uproar continues over last week’s grounding of Bolivian President Evo Morales’s plane in Europe, after U.S. officials apparently suspected whistle-blower Edward Snowden of being on board, many questions remain unanswered about the United States’ role and motives. 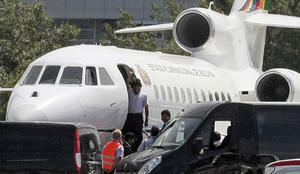 Presidential jet grounded in Vienna. Credit: EFE/ La Razón. But one thing is certain: if the U.S. government was seeking to intimidate Morales and other Latin American leaders who might consider harboring Snowden, its strategy has completely backfired. Instead, the incident has bolstered Morales’s domestic and international standing, consolidated regional unity, and emboldened the bloc of leftist governments that seeks to counter U.S. dominance in the region. It has also dealt a damaging, and potentially fatal, blow to the future of U.S.–Latin American relations under the Obama administration. The crisis was set off by Morales’s statement on July 2 in Russia, where he was attending an energy conference, that he would be willing to consider a petition by Snowden for asylum. Later that evening, on his return flight to Bolivia, Morales’s plane was denied entry into the airspace of France, Italy, Spain, and Portugal, forcing it to make an unscheduled landing in Vienna where it was diverted for 13 hours before receiving clearance to proceed. In response to Bolivia’s persistent questioning, the four European countries have offered equivocal and somewhat contradictory—if not preposterous—explanations for their actions. France, which has apologized to Morales, says it didn’t realize that the Bolivian president was on the presidential jet. Portugal, originally scheduled as a refueling stop, says its airport wasn’t capable of servicing the plane. Italy now completely denies having closed its airspace. Spain, after initially attributing the problem to the expiration of its flyover permit during Morales’s unexpected layover in Austria, later admitted that the United States had asked it to block the flight (although the United States has not acknowledged any role in the incident). At first, Spanish officials also claimed that the plane was searched for Snowden in Vienna at the behest of the United States—an action which, if taken without Bolivia’s permission, would constitute a violation of international law even more egregious than the denial of airspace to the presidential jet. 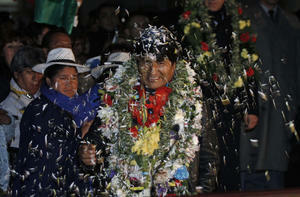 Morales arrives home to a hero's welcome. Credit: AP/ Juan Karita. More recently, Spain has insisted (and Bolivia concurs) that it ultimately granted airspace permission upon Bolivia’s written assurance that Snowden was not on board the plane. Spain, which has sought to improve economic relations with Bolivia after being hit hard by Morales’s nationalization of its airport management and electric companies, has also offered to apologize. Along with expressions of support from ALBA, CELAC, Mercosur, and other regional blocs, UNASUR issued a statement condemning the action on July 4, signed by six heads of state (Bolivia, Argentina, Uruguay, Venezuela, Ecuador, and Suriname) who attended an emergency meeting. Governments from across the region’s political spectrum (including Mexico, Peru, Colombia, and Chile) closed ranks behind Morales. On July 9, the OAS issued a consensus resolution expressing solidarity with Morales and demanding apologies and explanations from the four European nations (but not the United States.) Internationally, more than 100 UN member nations have collectively denounced the incident, bolstering Bolivia’s complaint before the UN High Commission on Human Rights. 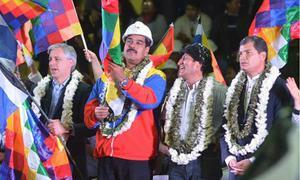 UNASUR meeting, Cochabamba. Credit: Jorge Abrego/ EPA. Still, in a region that remains heavily dependent on U.S. trade, the threat of U.S. retaliation through economic sanctions will be a major factor in the asylum calculus for any government, as illustrated by the recent case of Ecuador. After initially championing Snowden’s cause and apparently aiding his transit from Hong Kong to Moscow, Correa suddenly backed off after a phone call from Joe Biden, saying that Biden’s concerns were “worth considering.” While Correa has defiantly renounced Ecuador’s long-standing U.S. trade preferences as an instrument of “political blackmail,” he apparently hopes to replace them with an alternative set of duty-free waivers under the Generalized System of Preferences (GSP) program, an option that could be jeopardized by an asylum offer. Similar considerations will no doubt be of concern to Venezuela and Bolivia, should either of their asylum offers materialize into reality (a complex proposition, given the many obstacles to achieving Snowden’s safe transit). While political relations between these countries and the United States have been polarized for some time—with the U.S. government still failing to recognize Nicolás Maduro’s April election—Venezuela still exports 40% of its oil to U.S. markets, and the United States remains as Bolivia’s third largest trading partner (after Brazil and Argentina). Bolivia also enjoys some of the same GSP trade preferences that Ecuador is seeking, which cover around 50% of its U.S. exports. 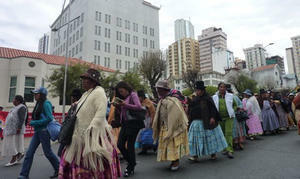 La Paz marchers demand closing of US Embassy. Credit: Sara Shahriari, Indian Country Today. Still, the incident has greatly strengthened both Morales and Maduro domestically and internationally, corroborating their anti-imperialist worldviews. For Morales—newly characterized by García Linera as the “leader of the anti-imperialist presidents and peoples of the world”—the wave of solidarity responding to his personal victimization has consolidated his political popularity in a pre-election year. Recalling the 2002 presidential election when the U.S. Ambassador’s negative comments about candidate Morales catapulted him unexpectedly into second place, García Linera jokes that Obama has become Morales’s new campaign manager. For Maduro, whose asylum offer is being promoted by Russia, the opportunity to champion Snowden’s cause and challenge the United States on a world stage, with substantial regional support, has allowed him to genuinely reclaim Hugo Chávez’s anti-imperialist mantle. “It provides the perfect opportunity for Maduro…to figure internationally, to show that he is a player among the big powers…and that he’s capable of challenging the United States,” says political analyst Eduardo Semetei. In terms of overall U.S.-Latin American relations, the episode could be a defining moment for the Obama administration. As Kinzer notes, the downing of Morales’s jet may have reflected a genuine U.S. effort to capture Snowden—as opposed to a shot across the bow to intimidate Snowden’s potential supporters—but even so, the depth of misunderstanding as to how the incident would resonate in Latin America is telling. New daily revelations from Snowden's data trove about massive U.S. spying programs in the region are adding fuel to the fire, further strengthening the leftist popular bloc—and confirming Glenn Greenwald’s assessment that the U.S. government has been its own worst enemy throughout this entire episode. It is difficult to imagine how the Obama administration can recover the region’s trust any time soon. Emily Achtenberg is an urban planner and the author of NACLA’s weekly blog Rebel Currents, covering Latin American social movements and progressive governments (nacla.org/blog/rebel-currents).